Our house has an entryway off of the garage that we use most of the time. I'd like to unify the colors - right now, there is one color of stain on the door. 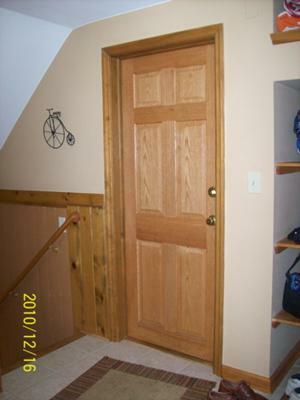 There is paneling to the left of the door that leads down a stairway to the basement (no door). There are two different kinds of paneling, one section is stained, and the other is painted. Plus there is trim around the floor that is a different color. None of it clashes, but none of it matches. The floor is a neutral toned tile that will eventually be replaced because the contractor did a horrible job of installing it. The walls are painted the same color as the walls opening to a family room on the same level, so if I change the wall color, I would pretty much have to change the wall color in the family room too. I thought I would start by painting the paneling all one color - maybe a dark brown? And then should I paint the door the same color? I would definitely try to match the colors as much as possible. Changing the wall color - and that of the family room too - seems like an unnecessary job so I would opt for trying to unify everything that is made from wood. That gives you the door, two lots of paneling and the floor trim. As you say, a dark wood stain is a good option and of course it's easier to make everything the same color if you go darker rather than lighter. By easier I mean that it is likely to take less coats of paint or stain to achieve a good finish. You mention that this area is open to the family room and I am wondering what the color scheme is like in there. With open-plan areas it is always nice if there is a common color thread. Rather than going for a wood-look stain you could think about using a nice shiny gloss paint made specifically for wooden surfaces. If, for example, your family room was fairly neutral in color but you used dark blue as an accent, you might consider making all the wood we mentioned dark blue too. Don't forget to bear in mind how light or dark the area is as this must be a consideration too.